Sun-Raised Farms is a network of 17 farmers engaged in a mutually-beneficial relationship with solar developers: the shepherds get pasture for their animals to graze; the solar companies maintain the lawns beneath their panels through natural means . . . 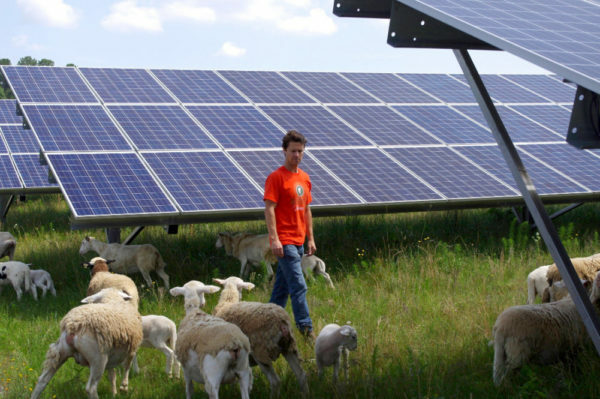 While Sun-Raised shepherds aren’t the only ones providing maintenance for solar developers, far from all of the state’s 341 large solar projects – an estimated 79 percent of which are on cropland – have the double benefit of sheep. But many still say solar is good for farmers, providing an economic boost, restoring wildlife habitat, and helping to ensure land that’s been in the family for generations doesn’t get sold to development. Read the entire article here. This entry was posted in NewsBlog and tagged economic benefits of land leases for solar development, farmers benefitting from solar development on their land., model for Nebraska farms, Nebraskans for Solar, solar leases a way to keep land in the family for generations, Sun-Raised Farms on August 28, 2017 by Helen Deffenbacher.